It’s been a wild term at Cubs, and all in good time for our wildest party ever, to celebrate 100 years of Cub Scouts. The term began back in September with the addition of Young Leader Bagheera (Jamie), the newest addition to the Pack. Through the term the Cubs were taught some parkour skills, Bagheera taught them about the police force and they also learnt about conserving the environment, all in fifteen jam-packed evenings with many other fun activities and games. Through the term we’ve been out and about a lot. In September we went to Stonegrove Park for some Athletics and in October we went swimming at Hatch End Pool. Some of our Cubs also came along to the firework display at Frith Grange and Jamboree on the Internet/Air as well as taking part in the District Bowling Competition and Ready Steady Cook. 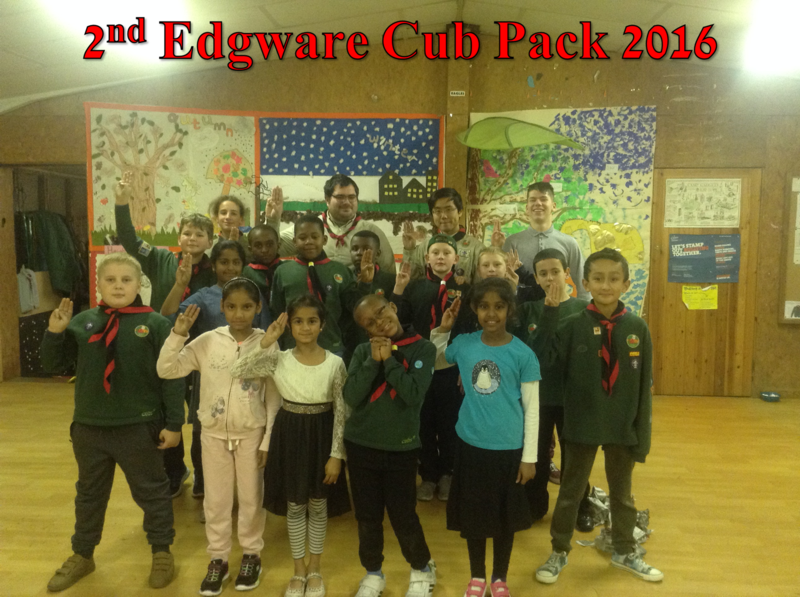 This term has also seen an increase in numbers up to 14 Cubs, which makes each evening even more fun. Also, the parent support this term has been incredible and so we give a massive thank you to all the volunteer parents who have turned up to support us when two adults have not been able to make it to support ratios. The highlight of the term and year, though, must be our Cubs100 celebrations. At the end of term we held a massive Pack party, with the hall transformed for Cubs100 – bunting, balloons, lights, Cubs100 T-shirts, music and speakers. A feast of food was provided, including cakes the Cubs made the week before. Parents, Cubs and GSL Sami all got involved with the evening’s events, including a ‘Name the Disney song’ quiz, disco and “Secret Santa”. The year was ended in true Cub Scout style at the R.A.F museum where hundreds of Cubs turned up for a promise renewal and showing of the original “The Jungle Book” film. It was this film that was inspired by Kipling’s book, “The Jungle Book”, and also the Cub Scout movement in 1916 – one hundred years ago, and with terms like these, it’s no wonder it’s still going strong. The year is nearly over, but we’re all getting ready for an even more amazing year. That just leaves me to say thank you to all the amazing Cubs who turn up each week and their amazing parents for their support, Happy Birthday Cubs, and to everyone, merry Christmas and have a happy New Year! See you in 2017!